Inspirational Spirit of the Phoenix, Inc.
Lite fare provided by Aunt Katherine's Kitchen, LLC! Seats are limited and filling up! Last Day to purchase tickets is Friday at 6:00 PM ! 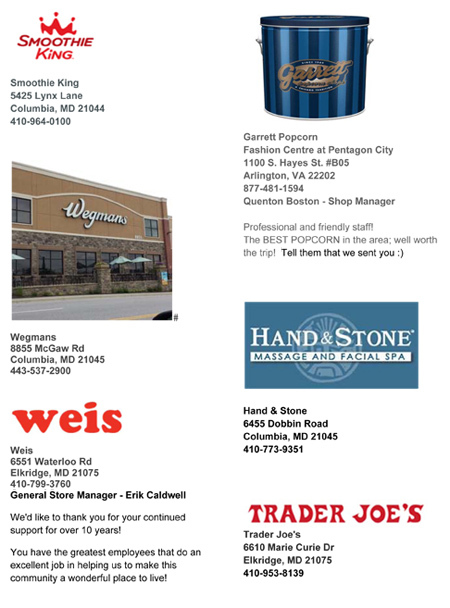 Click here or flyer for larger display! THANK YOU TO OUR SPEAKERS & SPONSORS! We would like to thank our Phenomenal Guest Speakers for taking the time to travel and share your valuable insights with our organization. You were OUTSTANDING! Dr. Dureke is the President & CEO of MargaretSpeaks, and Founder, President and CEO of WETATi, a Global Empowerment & Educational Network. She is a visionary LEADER and results-driven professional with over 26 years’ experience in motivational speaking, business startups and development; leadership, and entrepreneurship. Dr. Dureke is an accomplished author and publisher of several empowerment, self-development, business, and self-help books. 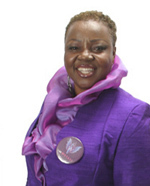 Please visit Amazon.com to learn more about Dr. Dureke and her publications. Mr. Geraldo is a principal in the Law firm of Robinson & Geraldo, and a long-time, committed community activist and volunteer. 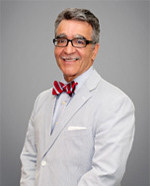 He currently serves as a Director on the Board of the Prince George’s County Community Foundation, a Director for the Portuguese American Leadership Council, Former Vice President of the Pro Bono Resource Center of MD, Board Member of the YMCA, Board member of the Maryland Legal Aid Bureau, and a member of the Maryland Court of Appeals Standing Committee on Pro Bono Service. 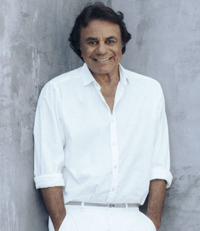 Child Justice, Inc. has announced that singing legend Johnny Mathis will appear and perform at the non profit’s 4th Annual Heroes of Child Justice Event in the nation’s capital. The goal of the event is raise funds in support of Child Justice’s life saving programs, which protect children “lost in the system” after exposure to family violence, physical/sexual abuse, substance addictions or neglect. Please visit https://child-justice.org/blog/ for more details. "Inspirational Spirit of the Phoenix" is an organization that is all about coming together as women to share information, bond friendships, renew our strengths, be empowered and connect with our inner spirit. The name is derived from the mythological bird, the Phoenix, that consumed itself by fire and then arose renewed by its ashes. Just as the Phoenix was able to renew itself, we as women can also rise above the most difficult circumstances. Our vision is the realization of the power that we as women have to have to make ourselves and our families become better world citizens, and to make our communities more representative of the goodness and cared we all have inside. Our organization is committed to helping women who in many cases have given up. We want these women to know that there is an organization out there, whose members have confidence in their ability to overcome the most desparate of situations, and like the Phoenix, rise from their despair more confident than before! 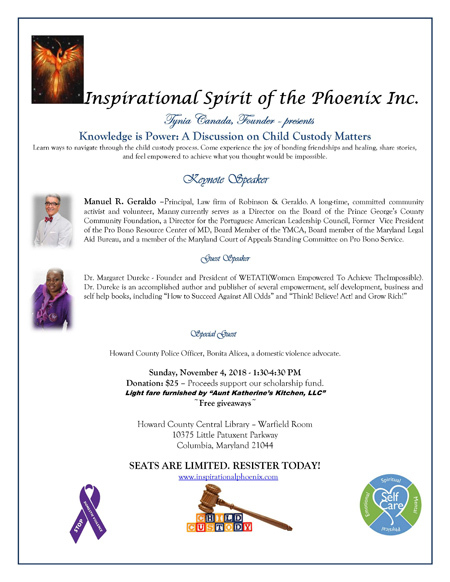 Read the Howard County Council (Maryland) Resolution honoring Inspirational Spirit of the Phoenix!